Within the constructions sector lie many workers who make and install components in homes, offices, stores, manufacturing plants and public infrastructure. Below, we profile the ten best paying construction jobs. Most do not require a college education, but workers in these jobs must undergo years of on-the-job training and education. The figures you see come from the U.S. Bureau of Labor Statistics. Employment of sheet metal workers through 2026 is expected to rise by nine percent. Job openings should arise as existing buildings will need upgrades to HVAC units and systems to meet current codes and environmental and efficiency standards. 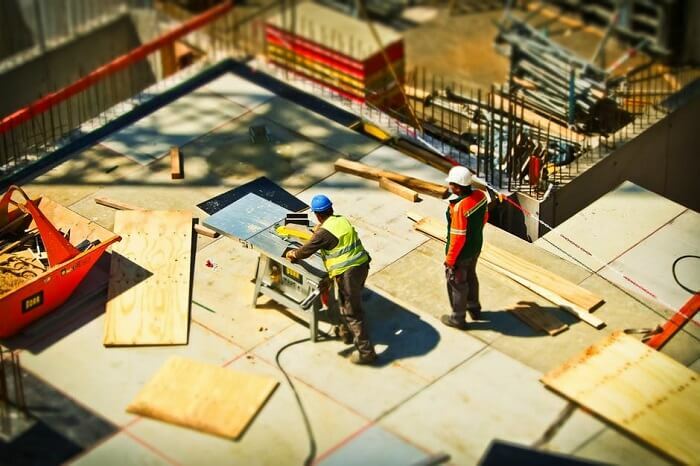 New construction may also sustain demand for these workers. What does a sheet metal worker do: Sheet metal workers handle thin alloys such as aluminum and steel for HVAC units and gutters. Fabricators use computer-aided drafting and design software and automated lasers, shears, and saws to create sheets of metal. Also, many sheet metal workers install the thin pieces into HVAC ducts or on gutters. Others may concentrate on repair and maintenance or testing of sheet metal. Belonging to the same field is the welder job. What annual salary a sheet metal worker has: The mean pay for sheet metal workers stands at $52,100 per year. While sheet metal workers in the top ten percent of earners have salaries above $87,120. In our best paying construction jobs, we feature occupations with many self-employed people. Becoming an electrician involves four to five years as an apprentice, 2,000 hours of on-the-job training and licensure. Moreover, employment of electricians should jump by 59,600, or six percent by 2026, thanks in part to the emergence of wind and solar power. What does an electrician do: Electricians install and connect wires and systems for lighting and electrical controls. Necessary skills include reading technical plans and distinguishing color-coded wires. Electricians in new construction projects can expect generally an easier time than repairers in existing buildings, who must reach tight and enclosed spaces. What annual salary an electrician has: Electricians earn on a mean basis $55,590 every year. Meanwhile salaries in the 90th percentile run above $88,130 per year. Many of our best paying construction jobs involve heavy equipment and require significant skills, care, and attention. Most crane and tower operators must have certification from the National Commission for the Certification of Crane Operators and receive OSHA training. Meanwhile, O*NET projects growth of five to nine percent through 2026 in the field. Construction of multi-story buildings drives the demand for these operators. What does a crane and tower operator do: To safely and efficiently move construction materials and equipment, operators must ensure that loads do not exceed limits, understand hand signals and instructions and inspect equipment. Also, remote controls and consoles often help the operator move the cranes or other lifts. What annual salary a crane and tower operator has: The median salary for these professionals is $55,690 per year. While pay for those in the upper tenth starts at $84,290. You can also look at the prospects for a forklift operator. Buildings with reinforced concrete and steel stand a better chance to withstand storms and other natural or man-made impacts. Structural iron and steel workers meet the demand for these stronger buildings. Therefore, employment in the field should increase by 13 percent by 2026. What does a structural iron and steel worker do: These workers install iron and steel to reinforce concrete walls, bridges, and roads. Their specific tasks include welding, bending, signaling crane operators, aligning beams and rods and connecting the iron and steel components. Structural iron and steel workers handle cables, wires, shears, bolts and welding equipment, among other items. What annual salary a structural iron and steel worker has: Workers in this field fetch on a mean basis $56,940 per year, with the tenth percent of them to earn above $92,310. Demand for skilled workers to handle upgrade projects and new types of materials appears as a theme in many of our best paying construction jobs. Employment of plumbers, pipefitters, and steamfitters should grow by 16 percent, or 75,200 through 2026. Moreover, new buildings or homes may contribute to job opportunities. Also, approximately 13 percent of workers in this category are self-employed. Check out a similar position, that of the hydraulic mechanic. What does a plumber, pipefitter, and steamfitter do: These three occupations share the essential roles of installing and connecting pipes. The distinction lies with what flows through the pipes. Plumbers deal primarily with the flow of water, gases, and sewage in and from homes, businesses and production facilities. Also, they install toilets and sinks along with pipe systems. Meanwhile, pipefitters work mostly in industrial plants and commercial facilities. What annual salary a plumber, pipefitter, and steamfitter has: Plumbers, pipefitters, and steamfitters have a median yearly salary of $57,070. Meanwhile, the 90th percentile salary rises to $91,810. Construction and building inspectors work in government and private-sector firms. These jobs should grow by 10 percent until 2026 since continued new construction and replacements of plumbing, electrical and other systems will sustain the need for inspectors. Also, self-employment occurs prominently among home inspectors. What does a construction and building inspector do: Government building inspectors examine construction work at various stages for compliance with building codes. These inspectors issue occupancy permits or certificates when the final construction has passed the codes. In engineering or architectural firms, inspectors certify that the work conforms to plans and other requirements. While “home inspectors” review the home’s condition and serve often in connection with real estate sales and purchases. What annual salary a construction and building inspector has: On a mean basis, construction and building inspectors make $62,020 every year. While those in the 90th percentile make pay above $95,340. The boilermaker occupation numbered 17,200 job positions in 2016 and should reach 18,700 by 2026. As with many of the best paying construction jobs here, boilermakers will be needed to replace outdated infrastructure and equipment. What does a boilermaker do: The installation, repair, and maintenance of boilers and tanks holding gases and liquids are a vital part of the boilermaker job description. Boilermakers align, fit, assemble and connect components of boiler systems, equipment that reduces or eliminates air pollutants, smokestacks, and similar systems. Meanwhile, their work environments include buildings, dams, water treatment facilities and large industrial facilities. What annual salary a boilermaker has: For this professional, the median salary rests at $63,010 each year. While the top ten percent of earners have salaries north of $87,160. Next on our best paying construction jobs roster, we have the elevator installer and repairer. The field of these professionals may expand by 2,700 through 2026, with the occupation having 22,100 workers in 2016. While the health of this job sector depends on the new construction of office buildings, multi-floor shopping centers, resorts and hotels; and other places that rely on elevators. Jobs may abound especially in tourist destinations that need to accommodate new high-rise hotels and resorts. What does an elevator installer and repairer do: The job description of an elevator installer and repairer involves the assembly of escalators, elevators and similar cars and their connection to electrical systems in the facility. Installers and repairers test operation, diagnose and repair defects as well. Moreover, they must piece together and ensure the safe operation of doors, steps, and switches. What annual salary an elevator installer and repairer has: On average, elevator installers and repairers enjoy annual pay of $77,130 per year. Those landing in the top ten percent of earners can see more than $115,880 per year in pay. While even in the 75th percentile, pay climbs above $98,700. Most of the occupations profiled here require normally completion of apprenticeship programs and perhaps a high school diploma. To become a civil engineer means having at least a bachelor’s degree and a license to practice engineering. By 2026, the hiring of civil engineers should jump by 11 percent from 2016. Civil engineers will see a need for their services as bridges, road systems, airport facilities and other structures require replacement, improvements or additions. What does a civil engineer do: The planning, design, and oversight of major and public construction projects fall into the duties of the civil engineer. Particular tasks include preparing and certifying plans, obtaining permits for work, supervising work in accordance with plans and applicable regulations and rendering opinions on environmental impact and other matters. What annual salary a civil engineer has: The mean yearly salary stands at $91,790. While the top one-quarter earns above $109,930 and those in the 90th percentile make more than $138,110. Construction managers represent the sole group on our list averaging in the six figures. In areas and communities with growing populations and business activity, these managers will find strong employment or work prospects. Therefore, the field should experience an 11 percent climb in employment through 2026. What does a construction manager do: Sometimes referred to as general contractors, the construction manager oversees the building project. They determine the cost of the project, select subcontractors for particular portions such as plumbing and electrical and ensure that construction meets the budget and regulations. The job description includes meetings and consultations with architects, engineers, government officials and specialists to interpret and review plans and the progress of projects. What annual salary a construction manager has: Construction managers earn on average $101,000 per year. Meanwhile, in the top ten percent of earners, pay exceeds $159,560. Finally, landing a job in construction depends on experience and the demand or need for construction or upgrades to buildings. Those who become employed in construction help businesses, homeowners and other property owners comply with updated building codes and environmental standards. Let us know if your salary or job search experience follows what we highlight in this list of the best paying construction jobs.